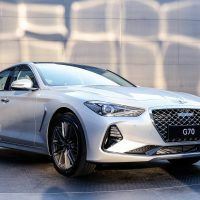 Many people say the sport sedan is dead but Hyundai’s luxury subsidiary Genesis thinks otherwise. 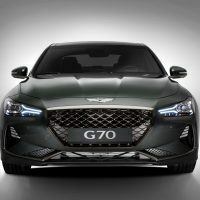 The 2019 Genesis G70 is the third and final sedan in the Genesis lineup, yet the third of six brand new models that are slated to debut by 2021. 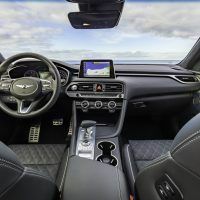 But unlike the flagship G90 and midsize G80, the 2019 Genesis G70 is bred and engineered to deliver a sportier and more athletic driving feel. 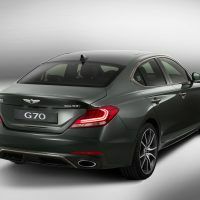 I found this interesting since the 2019 Genesis G70 has a longer wheelbase (111.6-inches) than the BMW 3-Series, Audi A4, and Mercedes-Benz C-Class. Overall length is also on the larger end of the scale compared to the German marquees at 184.5-inches. 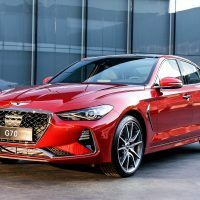 This tells me the 2019 Genesis G70 will offer driver-focused performance without ruffling your tail feathers. 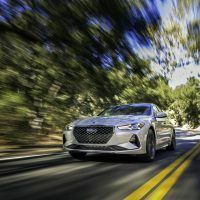 The new Genesis G70 was engineered by design and is equipped with the stiffest body structures in its class, according to the automaker. 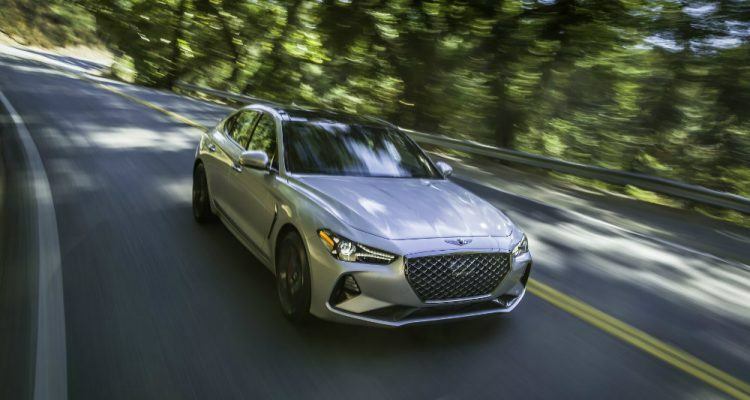 The strategic use of aluminum for the hood and strut tower reinforcement bars enables the G70 to have a lower center of gravity. 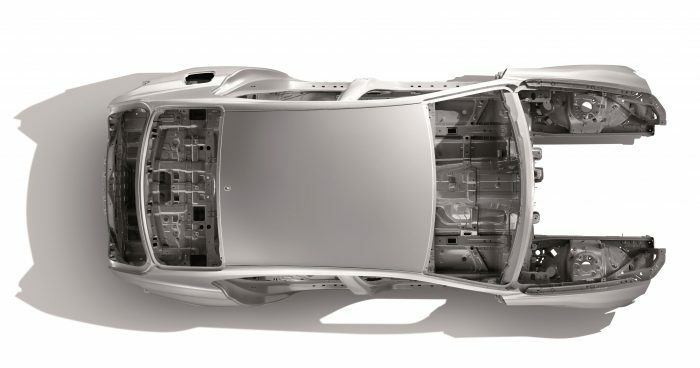 The car also benefits from an integrated frame that drastically reduces the number of physical parts needed to reinforce the chassis. The result of all this is telepathic steering, sportier handling, and better driving dynamics. The rigid body structure and longer wheelbase also equates to a smoother ride. Photo: Genesis Motor America, LLC. 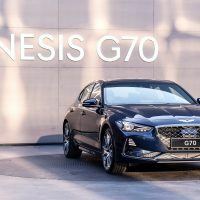 Genesis designed the 2019 G70 under the company’s Athletic Elegance ethos. The new saloon has the widest overall stance and lowest overall height in the segment. The kinetic form factor of the exterior panels was enough to return a sleek and aerodynamic 0.28 coefficient of drag. If you slap on the more aggressive 19-inch wheels and Michelin Pilot Sport 4 summer tires, the coefficient of drag is still a slippery 0.29. So far, it seems Genesis created a recipe for a truly scintillating dish. Stiff and rigid chassis? Check. Aerodynamic body design? Check. So, what’s next? 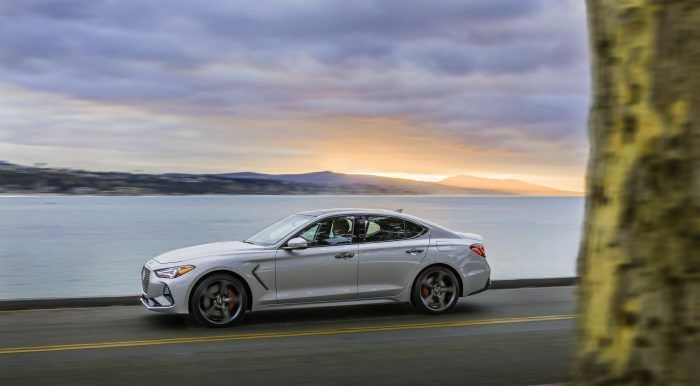 The 2019 Genesis G70 can be configured with a 2.0-liter turbocharged and direct-injected 4-cylinder gasoline motor with 252 horsepower and 260 lb-ft. of torque. This engine benefits from a smaller turbine wheel, motor-driven intake variable valve timing system, and a two-stage relief oil pump to improve low end torque and engine power. 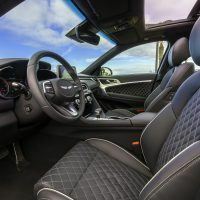 The crème of the crop is the 3.3-liter twin-turbocharged and direct-injected V6 motor that churns out 365 horsepower and 376 lb-ft. of torque. Curiously enough, both motors can be found in the Kia Stinger. The V6 motor is equipped with a single scroll, twin turbo system, integrated exhaust manifold cylinder head, a dual-stage variable oil pump, and the Mid Position Lock Continuously Variable Valve Train system (MPL CVVT) to improve engine response and efficiency. Transferring power to the rear wheels is the standard eight-speed automatic with rev-matching and gear-holding technology. All-wheel drive is an option for either engine. A mechanical limited-slip differential is standard on the 3.3 (rear-wheel drive) and optional on the 2.0 (also rear-wheel drive). What’s interesting is the availability of a six-speed manual transmission on the 2.0 turbo, rear-wheel drive. 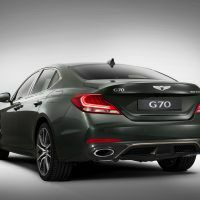 If you choose the manual, your G70 will also come with high-performance Brembo brakes, higher horsepower output (255 versus 252 for the automatic variant), a special exhaust, and additional weight reduction features. Other go-fast and performance-enhancing goodies include launch control, a rack-mounted and motor-driven power steering system, and Dynamic Torque Vectoring Control so you can attack corners like Mika Hakkinen on steroids. What we have here is an exciting and equally luxurious sports saloon that will give the Alfa Romeo Giulia, BMW 3-Series, and Audi A4 a serious run for the money. 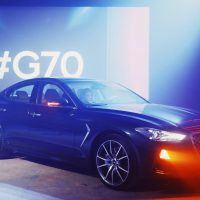 You can expect the 2019 Genesis G70 to arrive at U.S. dealerships this summer. Photos & Source: Genesis Motor America, LLC. 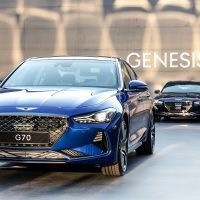 No Comments on "2019 Genesis G70: Korea Goes Head-to-Head with Germany"